So you want to start a podcast, St. Louis? Let this be your guide. 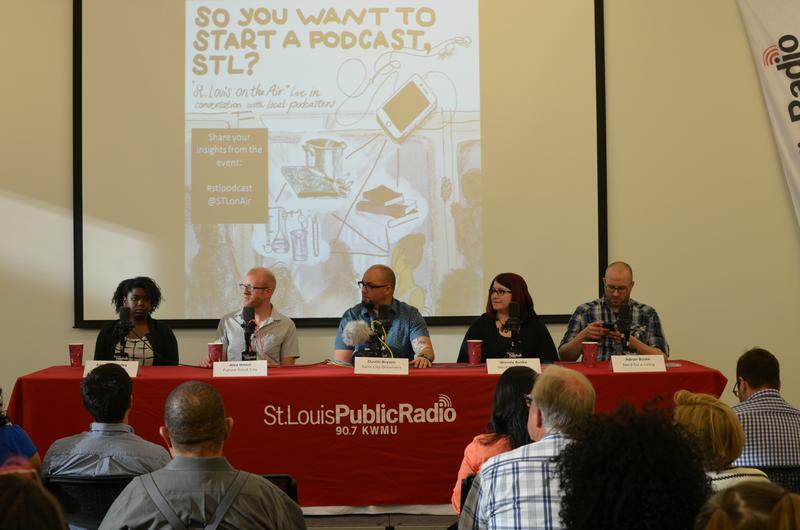 Kameel Stanley, Alex Ihnen, Dustin Bryson, Wendy Buske and Adron Buske share their podcast wisdom at a St. Louis on the Air live recording event on June 9, 2016. 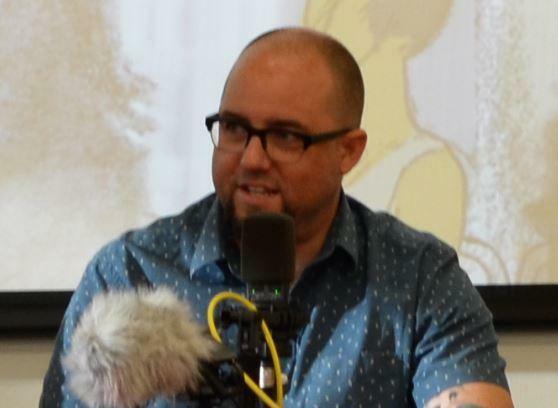 These are just five of the questions our panel of St. Louis podcasters answered on June 9 at a St. Louis on the Air live recording event discussing how audience members could start their own podcasts. A panel of five podcasters answered questions from host Don Marsh and the audience about why and how to enter the local podcast world. Below, we offer answers to some of the best pieces of advice from the event as well as our podcast of the event and the full, un-edited version of the panel for your listening pleasure. We also offer online resources at the bottom of this post for tutorials as well as St. Louis podcasting meet-up groups. We Live Here, Future Great City, Saint City Dreamers and Nerd for a Living were featured on the Saint Louis on the Air panel. So you want to start a podcast, St. Louis? St. Louis on the Air has you covered. Listen as local podcasters discuss how they got into podcasting and what you should know before you start your own podcast. This was recorded during a live event at St. Louis Public Radio on June 9, 2016. Wendy Buske, Nerd for a Living. Kameel Stanley, We Live Here. Alex Ihnen, Future Great City. Listen to Transom’s How Sound podcast: Want to learn how to make podcasts or do radio storytelling like NPR? This podcast will take you through everything from first-person reporting, to voicing to mixing music. Watch the How to Podcast video series: Sure, this isn’t the most entertaining video series you’ve ever watched, but you’ll learn the basics for free. Can’t beat that. Subscribe to Hot Pod: This email newsletter will keep you up-to-date on the latest trends in podcasting without overwhelming your inbox. Subscribe to the Hodgepod newsletter: The best way to learn something is to consume a lot of the best of something, amirite? This newsletter from WNYC curates some of the best podcasts they’ve heard all week for your consumption. Listen to The Big Listen: This radio show about podcasting introduces you to podcasts you’ve never heard of. St. Louis Podcast Meet-Up: This group of 130-or-so podcasters meets at least every other month to discuss podcasting. Subscribe to this Twitter list of St. Louis podcasts: Follow these local podcasts on Twitter so you can hear about their new episodes and what they’re working on. Follow the #stlpodcast conversation on Twitter: On Thursday night, we used the hashtag #stlpodcast to coalesce the conversation around podcasting in St. Louis and share tips and tricks. Catch up on the conversation here. Join this St. Louis Podcast group on Facebook: This group “is dedicated to help support, introduce and grow the St. Louis podcast community.” Sounds like a good place to be if you want to learn how to podcast in St. Louis. Have a local podcast you think we should know about? Or other resources you think we should add to the list? 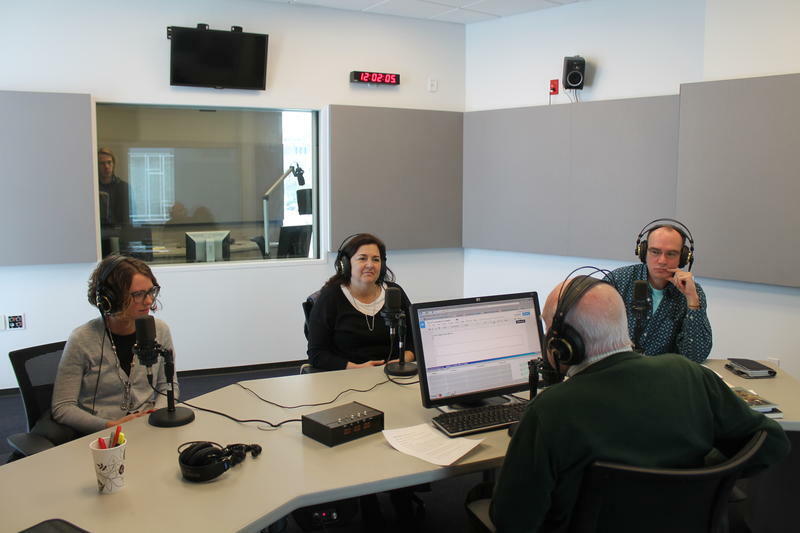 Email Kelly Moffitt at kmoffitt@stlpublicradio.org or tweet @STLonAir. We may add your suggestions to this post. St. Louis has had a long and star-studded literary legacy but what’s often left out of that narrative is how the legacy is still in full-bloom through literary magazines. These print publications exist in this city to showcase new and old writing talent alike and some of them are nationally-known frontrunners in the lit mag world. Comics are no longer solely relegated to syndicated placement in newspapers or in comic books—the increasing popularity of the World Wide Web changed that. Today, you’re just as likely to find a comic you love on a Tumblr, Facebook page, or webpage than in a comic book shop. These web comics (that come in strips, series, and serials) are often an entry for women and people of color into the world of comics and comic book publishing — a field typically dominated by white men.